Celia Gwynn – ‘THE SPINNING LADY’ - from near Chelmsford, Essex in the U.K.
Photo by Keith Thompson I'm happy to give talks to groups of all sizes and always demonstrate spinning at the events I attend. 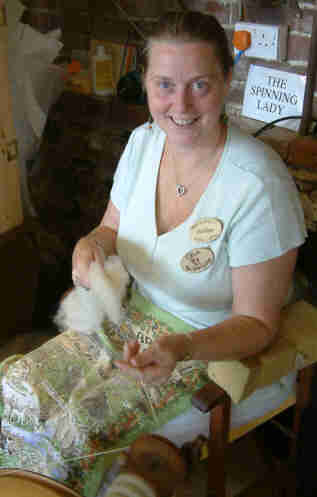 I’m known as ‘The Spinning Lady’ as that is what visitors call me when they see me Hand Spinning at events. After hearing this a friend made the phrase into a sign for my craft stand. I’ve been spinning over 30 years now, having learned the basics whilst on a weaving holiday with Martin Weatherhead in Pembrokeshire, South Wales in the early-mid 1980s. 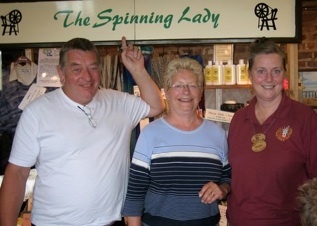 Martin still arranges weaving and spinning holidays and his web site is www.snail-trail.co.uk. Over the years I have taken courses in yarn design, spinning techniques and hand dying. This has culminated in to what I do today, spinning yarn in quantities for knitters to knit up or crochet with. See ‘Celia’s Spinning’ page for more information. Each year I attend a number of craft events where I sell my yarn. See ‘Celia's Events’ page for current details. If you are interested in booking me to talk to your group or to demonstrate spinning at your event, please look at my ‘Talks and Demonstrations’ page. Alongside my hand-spun yarns I sell a range of wool fat (Lanolin) skin care items, as they are made from the grease that is removed from the wool in the cleaning process. These items are made by a family chemist in Bradford, and are a traditional natural product that is kindness itself. Only the very highest quality ingredients, including the purest and most preservative-free wool fat, are used in their production, and they are NOT tested on animals. See the ‘About Lanolin’ page for more information on this cruelty-free, natural moisturiser. In addition to the items above, I also make and sell a unique range of sheep-themed greetings cards and I weave bookmarks in fine cotton and silk on an Inkle Loom.